The Danish quartet led by frontman/producer Anders Lundemark released this amazing record on SPV-Europe at the top of the year. After an initial European blitz in the media and on tour, they fell out with their record company and took back the record rights. Subsequently, this record has yet to enjoy a US/North American release. As they return to the studio to write new material, it is high time American thrash and death-metal fans got hip to Konkhra. 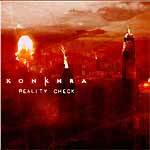 The best-kept secret in the thrash underground, Konkhra’s Reality Check is a blazing collection of hard, fast death-metal/thrash-metal that defies comparison. Certain press outlets in Europe are calling their music “Death N’Roll,” and the moniker couldn’t be more appropriate. In short, Reality Check is extreme, heavy, and blistering, but always catchy. This kind of accessibility might alienate the most die-hard of thrash/death fans, but a casual listen to song samples on their website should confirm that Konkhra’s commitment to the genre and intent to reignite it are beyond reproach. The head-spinning opener, “Warmonger,” churns with an infectious groove and drum-fills that Dave Lombardo would salivate over. The vocals are mixed low to accent the gravity of the singer’s growl. Superjoint fans take note, and conjure an image of a less-hoarse Anselmo working out some demons. The bridge before the lead break recycles the opening riff: then the song gives way to a solo that rides into its own contagious world, making it as effective and memorable as the riff the song is based on. Lyrically, Anders covers the dark territory oft-mined in this genre, (Hell on Earth metaphors; hatred and its course throughout humanity; religion as a potentially lethal mind-control drug; war; reflection on the self/introspection, etc. ), without veering off into self-parody as many do. On the contrary, the lyrics serve each song well. Hardly poetic, each song feels as if it was “ripped from Today’s headlines.” Indeed, the graphics of the album cover convey this; and give the record a darkness that no amount of Norwegian corpse paint could express. Extreme metal fans in The US who haven’t already discovered them would do well to investigate Konkhra at their website, konkhra.com. All of their CDs are for sale there, including this throttling, metallic rash-of-stabbings.